My giant Hubbard squash is a deeply orange-colored and flavorful variety that, because of its hard shell, keeps for a long time. When roasted in the oven (350 degrees, 30-40 minutes), it can be further reduced to make pies and other baked goods that often prefer canned over roasted pumpkin. Here I added pureed roasted squash to the chicken stock that I used for risotto’s liquid base. Vegetable stock would have produced a similar result. 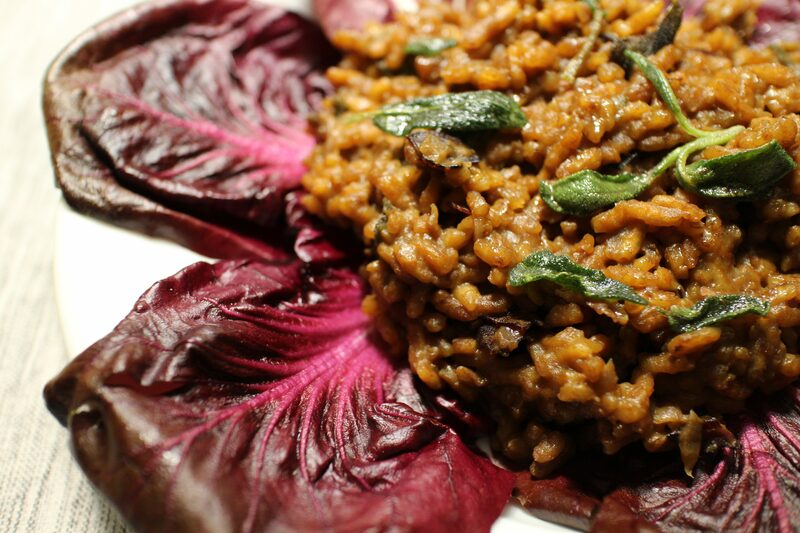 The basic approach to risotto is to cook aromatics in butter, add rice, stir to coat and release the surface’s starch and, over medium low heat, gradually add small amounts of liquid, stirring to avoid sticking to the bottom of the pan (which squash will accelerate). Patience is required but this is not hard. Mix the pureed squash with the stock in a saucepan and bring it to a simmer on the stove. In a large saucepan over medium heat, saute the onion, sage leaves and prosciutto in oil and/or butter. Remove a couple of sage leaves for garnish. Add rice and stir to coat. Add white wine and stir to allow it to evaporate and also instill the ingredients with flavor. Add1/3 cup of the warm squash mixture, turn the heat to medium low or low (so that it just simmers) and stir until the liquid is absorbed. When the liquid is absorbed, add another 1/3 cup, wait until it’s absorbed, stirring occasionally, and then repeat until the rice is tender but still al dente. This process will take about 20-25 minutes. Add grated cheese and salt to taste. Garnish with the reserved sage leaves. Serve warm.